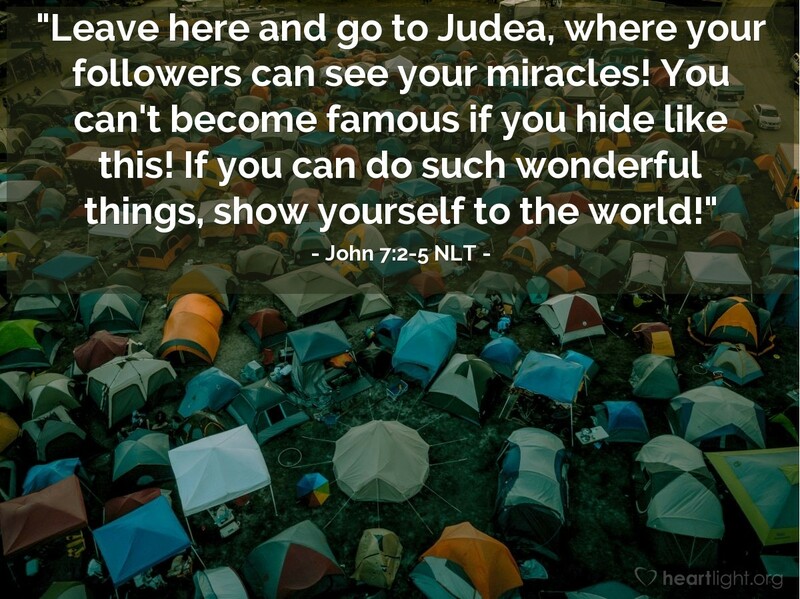 But soon it was time for the Jewish Festival of Shelters, and Jesus' brothers said to him, "Leave here and go to Judea, where your followers can see your miracles! You can't become famous if you hide like this! If you can do such wonderful things, show yourself to the world!" For even his brothers didn't believe in him. Imagine how hard it must have been for Jesus. His family just didn't get it. The Lord's physical half brothers and sisters didn't understand and didn't believe until after his resurrection. Jesus didn't do miracles to "show out" for his disciples but to give them a sign to look beyond what they were seeing and understand that he had come from God. Jesus wasn't trying to be a public figure, but instead, he resisted the crowd's desires to make him king. The things that would ultimately draw people to him would be the cross and the resurrection. His signs, the very miraculous things his brothers tried to goad him to perform, brought a stronger faith to some, only more questions to others, and a determined rejection of him to even others. Jesus wouldn't be bullied, teased, or ridiculed into anything. He would follow God's timing and do things God's way. Holy and faithful Father, please give me more patience to wait for the right moment to do what you want me to do and the courage to do it with passion and faith. Give me the strength to resist any negative peer influences upon me. Forgive me, loving Father, for the times I have gone with the crowd so I would be accepted and have not stuck to your plan no matter the cost. In Jesus' name, I pray. Amen.